We woke up late this morning after a nice Christmas Eve family gathering the night before. We had our daily cappuccino and sampled some yummy Belgian chocolates sent from JP's mom. 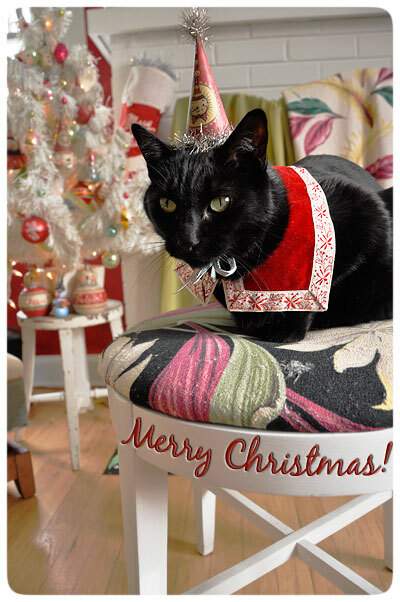 Then, I realized that Jack had not fashioned this year's Christmas attire. So, I scurried down to my workroom and pulled a snowman hat from last year's collection, added tinsel and ribbons. "Meow Meow" he kept saying as I added glue and trims. He always knows when it's photo time! For a collar, I recently found a vintage holiday style velvet choker in my grandmother's belongings. I hope she wouldn't mind Jack borrowing it for a holiday shoot! He seemed to like it! Anyway, JP and I snapped some fun photos, and this was our favorite! ENJOY, and have a Merry Christmas Day!